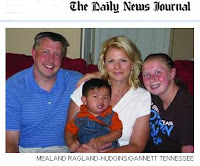 In April 2002, 16 families traveled to China as Children's Hope adopting families. This past Saturday, 14 of those 16 families traveled to Kansas City, creating a bond that may last their entire lives. The trip was part of a biennial reunion commitment, with families using their vacation time to come together so the girls may also grow up together. This year, in line with the 2008 Olympics in China, the girls competed in their own mini-Olympics. See video and the full article on this reunion in The Kansas City Star online at www.kansascity.com. One-year-old Aidan Denison was a cover model. 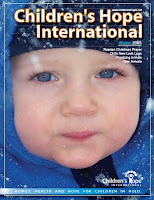 The boy, adopted from Kaliningrad, Russia, was the face for the Children's Hope International quarterly print newsletter in winter 2005. Nearly 3 years later... look at him now. 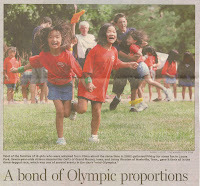 All eyes, including Children's Hope families', are on China as the Olympics begin on August 8th. Nine Children's Hope families are traveling to China to complete their international adoptions Thursday, July 25, prior to the events. Another 15 families will travel in August, adding precious children to their family and changing their lives forever. The Travel Channel will devote a week's worth of programming on the fascinating country of China - its food, its animals and its culture - through six episodes of Wild China and presentations by Travel Channel's Samantha Brown and Anthony Bourdain. The country spotlight begins Sunday, July 27. Reading Can Benefit the Vietnamese Nutrition Program! Usborne Books joined the Night of Hope and 2008 Children's Hope Annual Reunion Picnic the weekend of July 18-19. For two additional weeks, proceeds from their online book sales will benefit the Children's Hope Vietnamese Nutrition Program! Click here to shop online and help make 3 nutritious meals a day possible for a Vietnamese orphan. One of our adoptive families is setting up a boys' group for those who have adopted boys into their families. It is open to all international adoption families in the St. Louis area. "My prayers for this group are to have fun and fellowship for our boys, to guide us to mentor them and help them be proud of their beginnings. 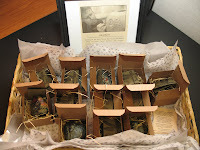 Without their beginnings none of us would have the blessings of our forever families with boys," says this adoptive mom. For more information you may contact the group by email or visit the group's yahoo home page. A Children's Hope Kazakhstan mom is one of four founders of Kazapalooza. After a successful event in June, the organizers are gearing up for next year's event. See photos from 2008 and help them select dates for Kazapalooza 2009 by clicking here. Thank You For Joining Us at the 2008 Annual Reunion Picnic! Everyone at Children's Hope wants to thank YOU for joining us at the Children's Hope International 2008 Reunion Picnic with special event Night of Hope! Every year, Children's Hope supports nutritious meals for the Vietnamese orphanages we work with for international adoption. Friday, the evening before the reunion, A Night of Hope silent auction at the Marriott West in St. Louis County allowed families to come together to support this cause, while enjoying each other and a relaxing evening. Check out our Children's Hope Artists on our Associate Program's MySpace page by clicking here. Lend your support for these great artists; become a friend! The event outdid itself! Forty plus auction items led to initial excitement, as an appearance by St. Louis Cardinal's Fredbird kicked it up a notch. Fredbird elicits smiles, handshakes, hugs, and the occasional shyness. Those not shy of the big friendly bird were able to join him in the Hokey Pokey and a sing-a-long. Everyone was sad when he had to leave, but Cicoff the Jester - a Children's Hope Artist and performer soon took over the stage. Between juggling and balancing feats, Cicoff managed to not only keep the kids' attention, but teach them heart-warming lessons to take home as well. As the evening progressed, the kids did not tire. Children's Hope Artists - Travis Lee Band and the Eric Prewitt Band - had everyone dancing! Children's Hope is so blessed by this new ministry, as we come together with artists with like-minded mission - to find homes, health and hope for children in need through Orphan Sponsorship. Lead singer Travis Lee's own sister benefitted from the loving support of a sponsor when she was a child. When she was adopted into their family, the extra care she received touched him deeply. Applause for these two bands, all around! Next year we look forward to another event much like this one - hopefully next year with some food! Spread the word and encourage your friends to come. It will be an all out bidding war, all of which will bring peace to a child's heart and a full belly so they may grow physically strong and emotionally ready for their future and a family. The Vietnamese Nutrition Program is still very much in need. If you feel led to support this project, please give at www.HelpAnOrphan.org. On Saturday, July 12, over 800 people from 23 states came together to celebrate at the Children's Hope 2008 Annual Reunion. Bandana's BBQ was served for lunch, with special guest and Children's Hope Artist Kiersten Venezia in performance. Also special this year were Chinese dancers, legendary face painting and balloon animals, a puppet show and a parade march for all the children. Thank you to everyone who came for making this a great event. All of our staff enjoyed meeting you and we can't wait to see you next year! Children's Hope Annual Reunion This Weekend! Across the nation families are packing their bags to come to St. Louis and the headquarters of Children's Hope International and our national reunion. Friday evening at the official hotel of the 2008 Annual Reunion Picnic - the Marriott West, families and those from the Vietnamese community will gather for a Night of Hope benefiting the Vietnamese Nutrition Program. We are looking forward to welcoming all of you tomorrow night - whether you are traveling from out of town or if you live nearby. We are going to have a wonderful night of entertainment with Fredbird (the St. Louis Cardinals mascot) stopping by, two Christian Rock bands performing along with Cicoff the Juggler. The night begins at 5:30 p.m. with our silent auction and will end at 8:30 p.m. For those of you staying at the Marriott West hotel, there will be information for you when you check in. Tickets are just $10 per adult and children are free. A sneak peek of two auction items! Our Vietnam and Foundation staff have been working hard on this event and we are excited for its inception. All the proceeds from the night will go to help the children of Vietnam in providing them with 3 meals a day and nutritious snacks. Friends and family are welcome! Saturday our Reunion picnic begins at 10:30 a.m. In your last moments of preperation, find details and directions online by clicking here. If you have not registered, you definitely can still join us; please bring a sack lunch. We can't wait to see you this weekend! All Vietnam families should view this encouraging document by clicking here; scroll through until the last page. The above linked letter is addressed to Secretary Rice in support of the recommendations in Joint Council on International Children's Servies' (JCICS) A Child’s Right Campaign for Vietnam . Through the hard work of JCICS member constituents and the petitioning of so many families of international adoption, this Campaign received a total of 149 signatories: 92 members of the House and 57 members of the Senate. "I am pleased to see so many signatures!" says CHI's Vietnam Program Director Nicky Losse. Everyone at Children's Hope shares her excitement. If your Congressman or Senator is not on this list, do please continue to urge them to join in this effort. We also ask for your continued prayers for the best resolution for all families adopting from Vietnam and for the orphans who have no home to call their own. 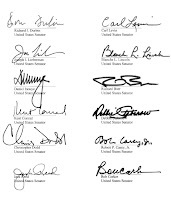 For full information and to view Secretary Condoleezza Rice's letter and all past updates regarding the A Child's Right Campaign for Vietnam, visit the JCICS web site by clicking here. Congratulations to our Ethiopia family that received a referral yesterday for siblings, 1 year old and 4 years old! We wish you all the best as you await your court date. 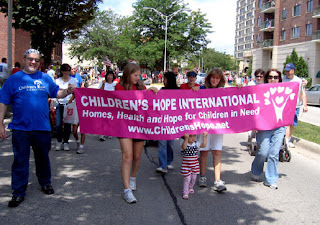 With stars, stripes, banners and fun, Children's Hope Upper Midwest families marched in the Des Plaines 2008 Fourth of July Parade - showing thousands the joys of international adoption. For more photos visit the Children's Hope Upper Midwest News page by clicking here. How did you celebrate your Fourth? Send your pictures for inclusion in the July e-news by emailing Jennifer.Newcomb@ChildrensHope.net. 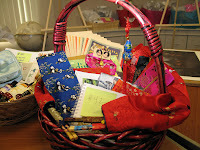 Children's Hope received three referrals today for Chinese expedited families. There were two beautiful little girls and one handsome little boy. The children are from the Jiangsu Province and are 11 months, 14 months, and 20 months old. These expedited families waited 18 months for their referrals. We also received one Letter of Seeking Confirmation, an official referral, for a family adopting a waiting child. Congratulations to these families! Even More Great News - Referrals! In more great news, last week our Ethiopia program saw even more June referrals for our families. Six children were referred to their forever families, including 1-month, 2-month and 8-month-old girls, a five- month-old boy and a brother and sister, ages 9 months and 3 years. Congratulations to the happy families! Our Vietnam program also received 3 referrals - 2 for healthy infant boys and 1 very handsome 5-year-old boy with special needs who is now waiting for his forever family. 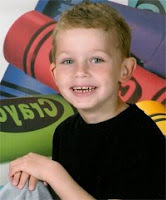 This young man's birthday was just prior to his being listed on Children's Hope Family.Net. Happy birthday from Children's Hope! Along with many families traveling on their first and second trips to Kazakhstan and Russia (despite even the typical slowdown during the summer months in these countries) and 2 new assignments and 5 families currently in Colombia to adopt, we also have one last piece of good news: 8 China families received their Seeking Confirmation Letters from the CCAA today - those are official referrals! We also received 3 pre-approvals for those China families seeking to adopt special needs children. Please join us as all of these families celebrate today. Congratulations!